Bellatrix, I'm a Pug! : I Wubba You! Daddy bought me this toy a while ago...but just recently I've made it my favorite. See it combines my two favorits things in the universe...my KONG...and my Flappy! I love to chase it and have daddy throw it for me. Mom can't throw it very well...she throws like a girl! Anyways...this toy is a KONG inside (which squeaks!) and it's wrapped in this material that I can really chew and not rip or nothin'. Dad likes to chuck it far and I run after it like a mad pug. Then he plays tug with me, and moves it around the floor (like I'm some cat or something!) and I can't contain myself!!! Oh the joy of playing with my KONG Wubba!! So if you're looking to "accidentally" (wink wink) grab a toy at your next visit to the pet store, I highly recommend it! Two giant black pug paws up! We's Wub Wub WUB your new toy!! Izzy has 'dat toy in yellows!! She buried its and Mommy forgots 'bout it. 'Prolly 'cuz IzZy realized she couldn't destroy its!! I's going to give its a ~whirls when I's get betters!!! Yousa makes it looks fun!! We have no toys to plays wit 'rounds hear!! Hiya Gang!! You have one in yellow?? Oh the toy is so amazingly fun, I can't tell you how much my playing with it makes my daddy laugh so loud. Anakin, throw it in the air and run away....it's starts to bounce and can bounce away and it's time to catch it. Helps keep us pugs in shape! 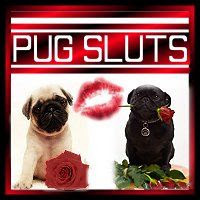 Side note to your mommy (Mrs. Elgins Pugs) Mom says she has spoken to lots of pug owners, and they all say the same thing. Black pugs are so different than the fawns. Apparently we're more energy and are really crazy. We act like we're puppies until we're way older...all owners say the black pugs are fun, but way more work. I think we're worth it! Ohhhh my uncle is a Queensland Heeler and he loves his Kong more than life itself! I will have to recommend one to him!!! Thanks! Hmmmm, kongs fall into the category of things we like to fight over. I wonder how the wubba would go over? KONG! 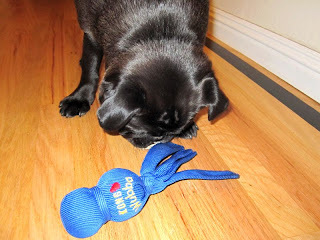 We got a new Kong in the traditional shape, but it is for Aggressive chewers..Thank you Lord. Do you destroy toys like we do?? Even ones that are supposed to be durable? Mom won't let me get a wubba kong because of the squeaker. Boo. 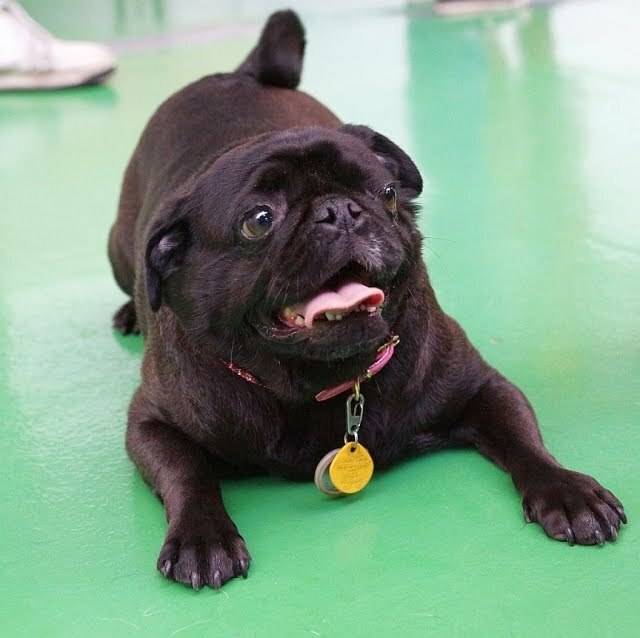 We vote for everyone to have a black pug!